Ra Ma Kaur calls on her passionate study of Kundalini Yoga, Elemental Medicine which includes the ancient Daoist lineage of Stone, Soundscapes, Ancestral Healing and Astrology to inspire and inform each offering she makes to her community. Current offerings include weekly classes, workshops, private mentorship, women's lunar gatherings, and ceremonies in the Asheville, North Carolina area. She works with women locally and virtually within the collective the Adi Shakti Coven. Annually she offers a global pilgrimage in honor the Divine Feminine and an awakening of Earth stewardship. Ra Ma also makes handcrafted stone and plant medicines, flower essences and tonics, which are available in her apothecary. Offerings often emphasize the sacred sound science of mantra and gong bath healing. Ra Ma even chants mantra while making botanical and stone medicines in her kitchen. She is dedicated to midwifing cosmic evolution through the weaving of spaces of sovereign sanctuary where we may fall in love with our Earth. It's the beautiful time of year that the roses in my backyard are beginning to bloom and the fragrance is intoxicating. 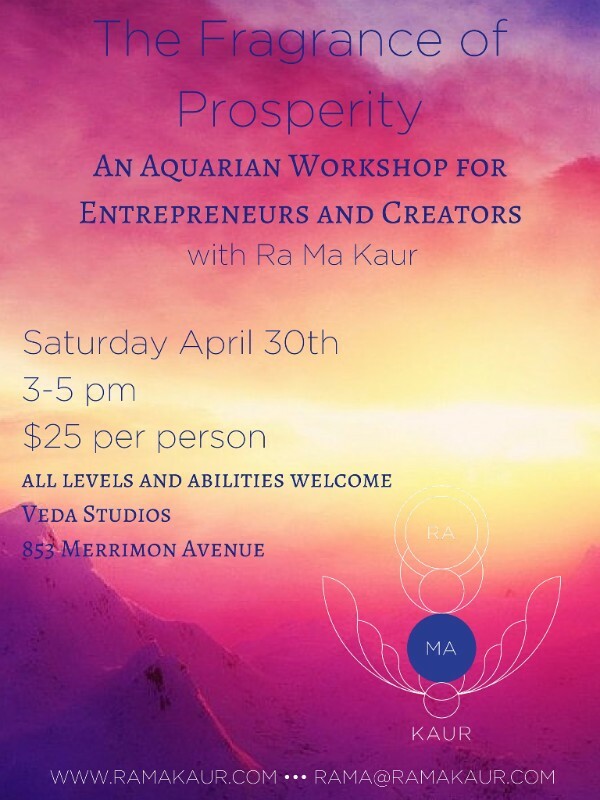 This Saturday I'm offering a special workshop at Veda Studios that ALL people can benefit from. On planet Earth we have a polarity of two streams of consciousness--poverty consciousness and prosperity consciousness. During our time together we are going work to dissolve imprints of the poverty consciousness and rhythmically align with the prosperity stream. The world needs us now more than ever to offer our creative genius. "Prosperity doesn't mean that you will have wealth, health and happiness. The best way to explain prosperity is to say it is like a rosebud when it flowers and opens up, and shares it's fragrance. That's the moment, which lasts a few days, when a rose flower is prosperous. When a man or woman is prosperous, it is the fragrance of security, grace, depth, character and truthfulness that a person can share. Like a candle emits light, a human emits prosperity." I spent the last week with my amazing stone teacher Sarah Thomas receiving 88th Daoist generation downloads on the ancient Stone Medicine. I am seeing amazing synergies between Kundalini Yoga and Stone Medicine and am so excited to unveil my newest Stone Medicine Elixirs in the coming weeks. If you've ever considered private sessions with me now is the time to jump in. I'll be offering an array of Kundalini Yoga, Meditation, Gong Resound Healing, Stone Medicine, Amethyst Biomat relaxation and Herbalism. We are in this great time of transformation and truth. What makes your medicine work is that it is your truth. I am here to assist you in connecting with your truth.